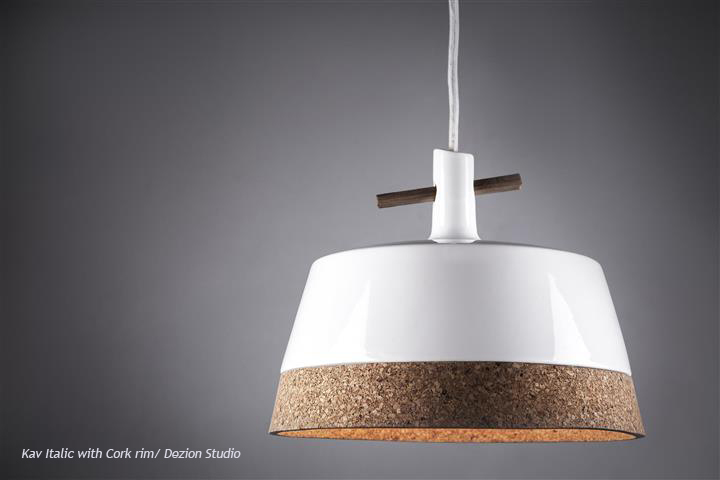 'KAV' pendant light is a clean, minimalist lamp made of two distinct and contrasting materials: ceramic and cork in one version and ceramic and wood in another version. KAV pendant light uses a single continuous line as the meeting point for these two vastly different materials, accentuating their individual characteristics. An elementary wooden peg placed through the neck of the lighting body locks the suspended light cable in place, in a simple, bold gesture. 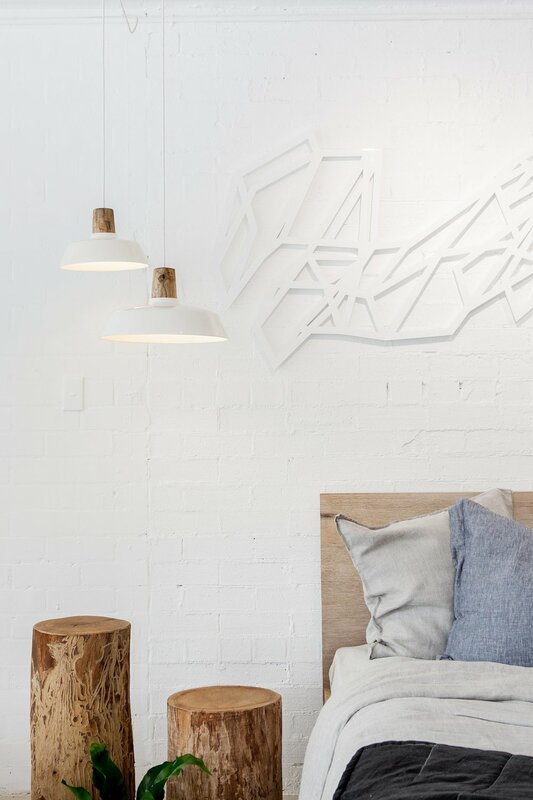 KAV pendant light aspires to simplicity in every aspect, from the manufacturing technique, to the joins and the final visual impact, while at the same time contributing an elegant, ethereal and timeless element to the space it hangs in. ‘Turns’ is a contemporary take on the classic industrial pendant. 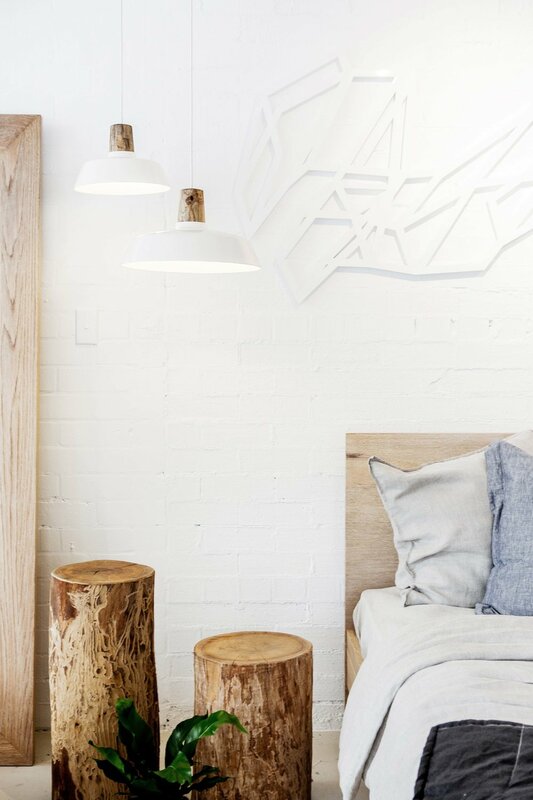 It combines a ceramic canopy over a hand turned timber with an innovative LED solution to form a timeless and warm yet highly functional pendant light. 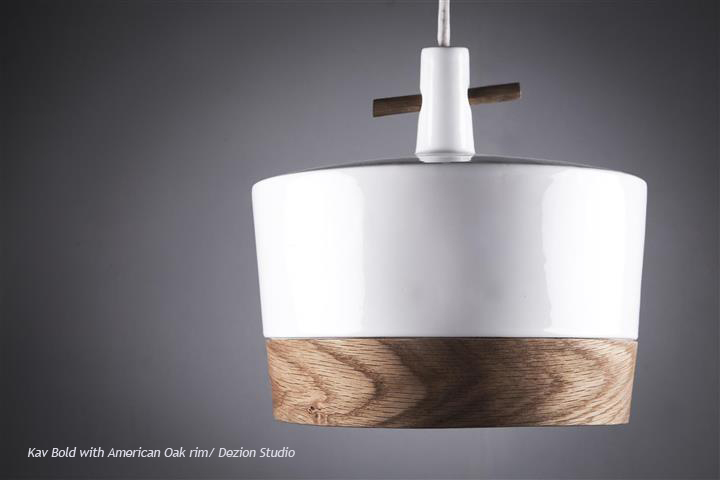 The LED light, softly reflecting from the ceramic canopy, accentuates the wood grain while resulting minimum glare; it makes 'Turns' a perfect choice where the pendant hangs low, like over a dining table or a breakfast counter. A slick and contemporary look is melded together with the time-honoured craft of plywood bending to form these stools. The clever use of bent plywood and solid timber creates a stool which is lightweight but sturdy, solid yet elegant. The stool is named after the Australian inventor, and pioneer of the post-war plywood industry, Ralph Symonds (1895-1961). Ralph Symonds’ factory created the world’s largest plywood sheets at the time, and was a substantial partner in the construction of the Sydney Opera House. These stools are a modest homage to the man’s great spirit and his part in Australia’s design and construction history. The Reconnect stool is an updated model of the “Cork Connection” concept stool from 2013. This stool features a cork seat as a centrepiece, encased in a powder coated aluminium frame. The natural and simple qualities of the cork are accentuated, through the contrast with the aluminium frame, and the use of basic joins and assembly, allowing the material itself to be the focus. The Cork Connection is a collection of three stools, featuring cork as their centrepiece, juxtaposing the cork with distinct and different materials and examining the relationships between these materials through the lenses of form, joins, and contrast. The collection features two stools with plywood frames and one with a stainless steel frame. The combination of these materials accentuates the natural and simple qualities of cork through the use of pure and simple joins and assembling techniques, allowing the material itself to be the focus. The plywood is bent in an angle that allows the cork seat to be locked inside the structure without any fasteners or adhesives. The round stainless steel stool features one continuous line that wraps around the cork seat to hold it in place.